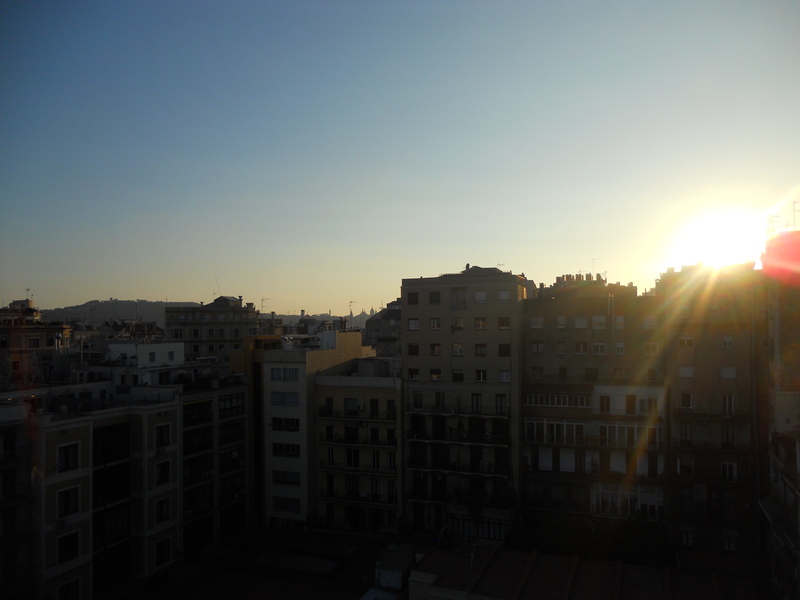 We recently went on a rather sudden trip to Barcelona last Christmas, where, upon arrival, our mother decided to make us walk some more and already begin to explore this cosmopolitan capital of Catalonia, the semi-independent region of Spain in its South-East corner. Barcelona has an incredibly rich culture and history, and the city that still stands today is full of these gratifying treasures, both old and new. 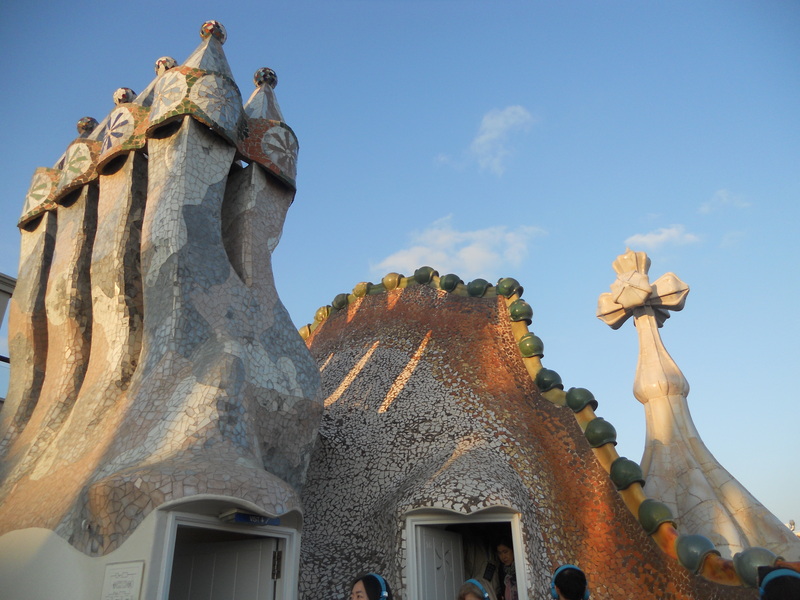 One of these such treasures are the many works of Anton Gaudí, dotted across the city. 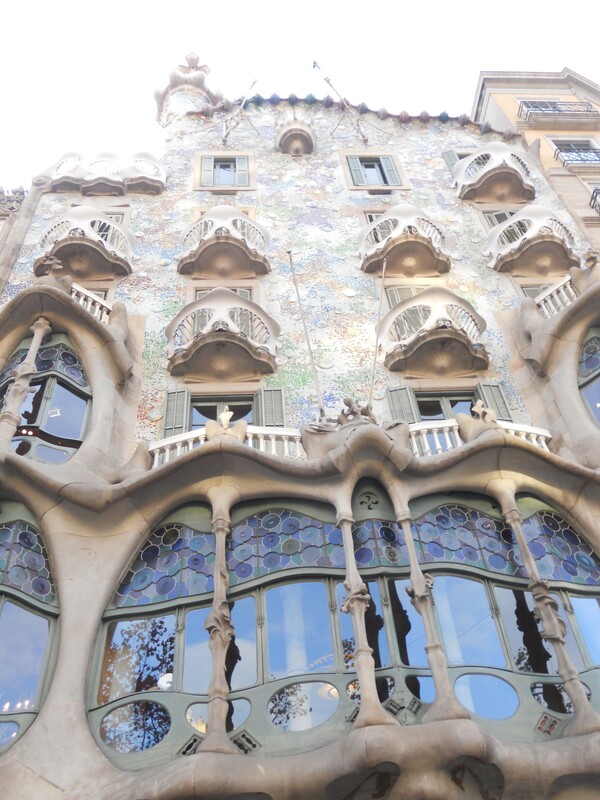 Casa Batlló was one such house, located on the grand Passeig de Gracia, which is accessible through many subterranean tunnels and metro systems which seem to stretch on for miles. Based on the sea, this otherwise ordinary townhouse has become a hurtling wave of discovery; from the outside, it looks like somebody replaced the original foundation materials with jelly. The building wobbles this way and that, at the will of the wind, its wavy curves lapping up the breeze and the many tourists that habituate this part of the wide street. Once inside, the nauseous irregularity continues: unevenly patterned mosaics, stone-shaped windows imbedded into the coral walls like jewels in a forsaken crown, a seemingly never-ending staircase as if it were torn out from the codes of P.T (Playable Teaser). Just not as bowel-inducing. Somewhat. The brilliantly high rooftop, adorned with intricately designed mosaic chimneys in the twisting shapes of dragons and other designs to deep for our unartful minds, was completed with a stunning array of light filters from the golden sunset that slowly dipped beneath the horizon of tall townhouses and wooded hills. 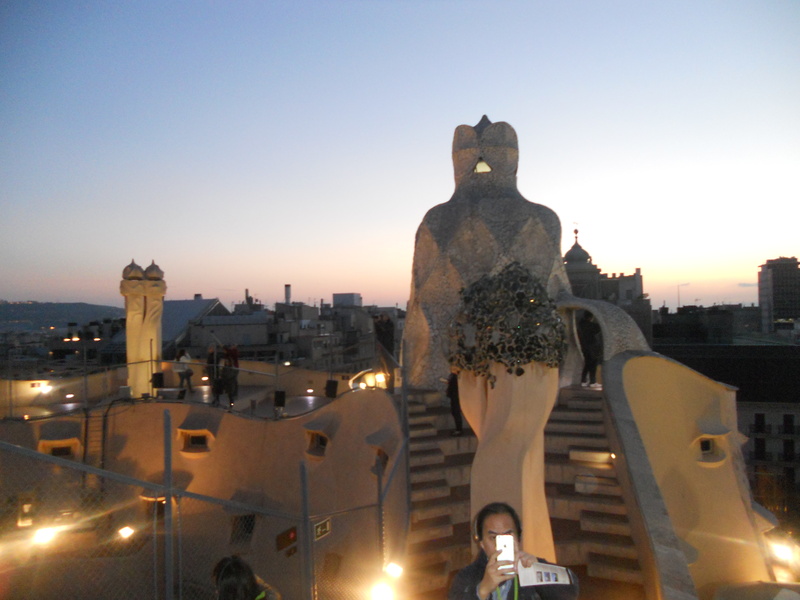 This was when we departed from Casa Batlló and headed to the other house of Gaudí’s; La Padrera, Gaudí’s zenith piece. Here, there were more unending switchback stairs that lead to an incredible rooftop of curves and softly defined waves, dotted with small, bubble-like indents about as large as a hand. Small cone-like pinnacles rose around each prong of the odd, sun-like shape. And like the flames and lava that flicker from the surfaces of the Sun, the ground swerves with its own beat, gently rising and falling with the dipping Sun, which was now falling uneventfully beneath the city, as the stars sprung up to welcome the moon, a bright gazing thing. The dark purple-blue haze was a colour you cannot get in cities such as London or Beijing, and never had I ever seen so many stars in Piccadilly Circus in my lifetime (provided, I haven’t lived particularly long, neither have I visited Piccadilly Circus many times at night) then I did there on that rooftop, with the wind blowing away the last of Christmas Eve. The streets, although brightly ornamented with Christmas lights, were still reasonably dark, and the streets were wide enough to still prove a potential hazard no matter how nice the Barcelonians are, so we stumbled home using the efficient T-10 tickets you can get at the metro (it’s in the name-ten tickets). You can use them for different people (well, no one really said anything and we were there for five days, so…completely ok?) and are perfect for families, granted it doesn’t get lost or leaves someone on the wrong side because you couldn’t count. 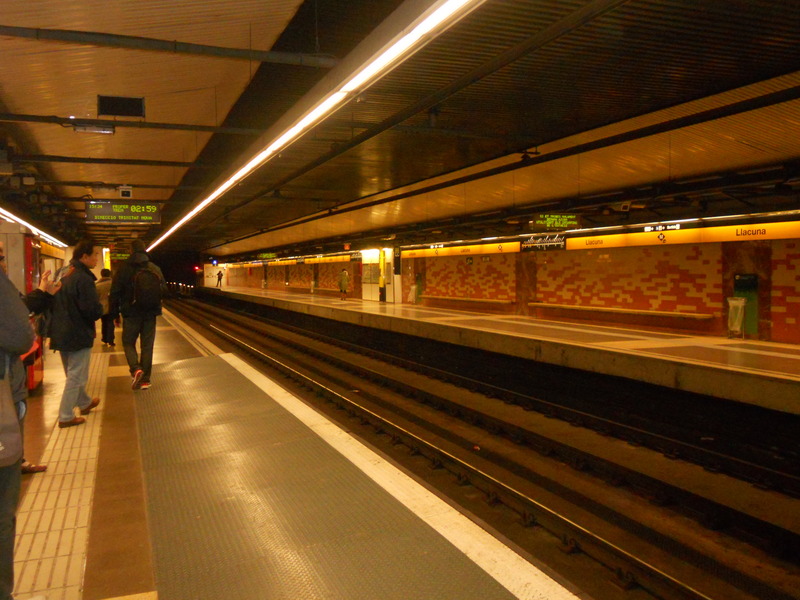 Barcelona’s metro system is reasonably effective; certainly of a higher efficiency than the beat down, practically ancient Underground system we have back in soggy old London. Ah, rush hours are such joy, aren’t they? Wet, cold and thoroughly grumpy, you are gifted for another depressing day at work for a crowded carriage too small for your stature filled with other equally wet, cold and annoyed people. At what I really wonder. Anyways, soggy London besides, we stayed at the newly renamed Illunion Hotel on Esquina Llacuna, probably about 10 minutes away from the sandy beaches, which are neatly empty on Christmas holidays. Although slightly difficult to access with a car-the taxi had to weave its way through one-way roundabouts, multiple pedestrian crossings and a wide range of rideable objects on a one-way only, one-lane only road, the hotel, if not the particular district, has a modern touch to it. Illunion has an outside swimming pool, a small gym and not to mention an absolutely stunning view of the sea. The glimmering waves reflect the sunny light, as if it were a large diamond basking in the rays, iridescent. On the other hand, for a four-star hotel, the rooms aren’t exactly up to standard: our bath had a sear through its placemat, allowing dirty bathwater to flow in. Result? A dirty, brown-coloured liquid to constantly flood out if you accidentally stepped on it, which was quite difficult considering its position in the bath, with a foul odour to accompany the murky colour. Not to say a broken TV. They do, however, provide complimentary water every day, and since it was the dead of winter, I assume that they do this in the summer too, unless they want to purposely dehydrate you in the staunch summers. By now it was already quite late, the sun long gone, yet the district’s nearby high street bustled with activity just about to begin. It was Christmas Eve, remember. The nearby metro station, Llacuna, on L4, was out of the question so we took a stroll through the calming streets. There were no drunks parading the streets like vanguards, blurrily singing some overrated carol, but families, couples, a woman and her dog(s). Two break-dancers had attracted quite a crowd and even gotten them to start clapping, so that their rhythmic beating echoed up and down the lane, which lead directly to the sea. There’s not much to see of the sea at night; just a raging mess of black hues, and the occasional frothy white as the wind whips up the waves in anger. We decided to go to Alianza, one of the larger establishments in the area. We hadn’t really gotten a sense of prices yet, and we were deprived of both sleep and food, so didn’t really complain when the manager hustled us into buying all sorts of nonsense. The nonsense turned out to actually be quite delicious, if a little pricey, in the end though. The highlight was definitely the six butterfly prawns in a buttery garlic and herb sauce tapas, at €11.50. The manager also provided a hefty amount of Iberian cured ham, cut delicately for a woody, neat taste, as well as a large salty paella, a smooth, refined onion soup that I think you should try-very homely-and a soft and tender calamari tapas that had bite but didn’t need to be chewed. It was one of the more expensive restaurants, if not the worst. I should really stop making you guys wait for things! So sorry for the delay. Day 2 coming…soon.